Today holds a special place in my heart. For the last 3 years my wife has been working with children with Autism helping them to overcome and manage behaviors that are reactive, inappropriate, and distracting to themselves and others. Her kids are amazing little creatures! While some are severely impacted many are not. They are so sweet and love making her get well cards when she is out. It’s impressive. Certainly I can never hope to achieve such satisfaction in my job as a software engineer. However, I can definitely try to help! 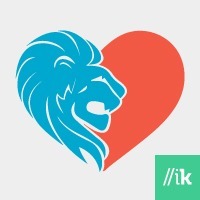 It is with great pleasure that I bring you LionHeart; a proof of concept aid for Behavior Interventionists delivering services to people with Autism. The concept of LionHeart came from my wife while we were discussing ways software could help influence medicine. She explained that her job as an Interventionist consists of going home to home to visit each child for a few hours. During the session she uses ABA therapy to help the child learn appropriate behaviors. First the Interventionist reviews notes from the previous session. 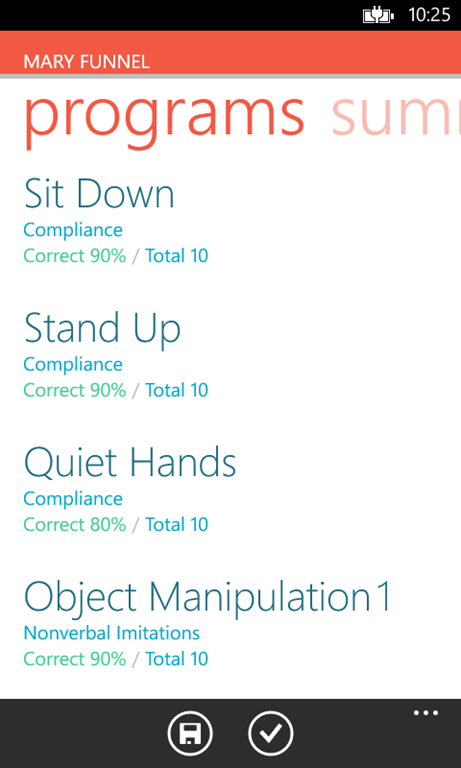 Then during the session the Behavior Interventionist will keep tally of behaviors and responses. After the session the Interventionist records qualitative notes in the child’s record binder. Every month the binder is collected and paper records are read and transferred to different paper records. It’s a very tedious job. The binder is then hopefully returned to the child’s home before their next session. If not, the Interventionist will have little to no idea how that child is progressing and how to proceed. Even with the binder, there is no easy way to see the child’s improvement over time in a specific program without reading weeks of session notes. Because it is so difficult to see progress over time it is rarely if ever done in the field. LionHeart is the solution. The app provides a hint at what digital records could look like. 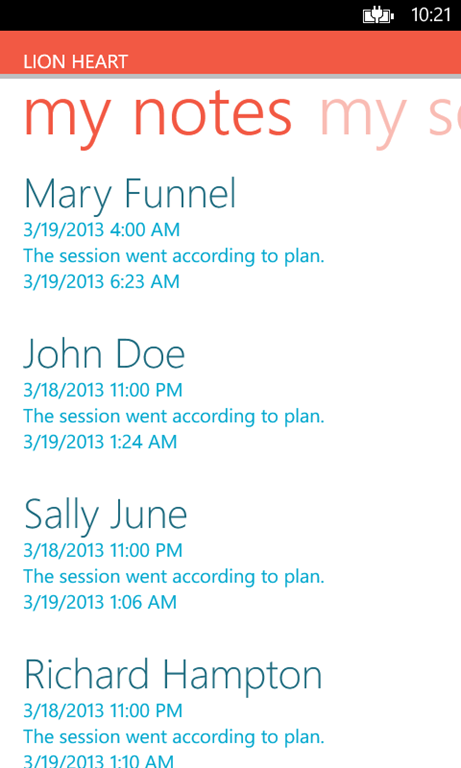 It also gives an idea of how easy it would be to generate reports in the office let alone in the field. The concept is that each Interventionist would have a device, like a smart phone or tablet, that would have an app like LionHeart installed. 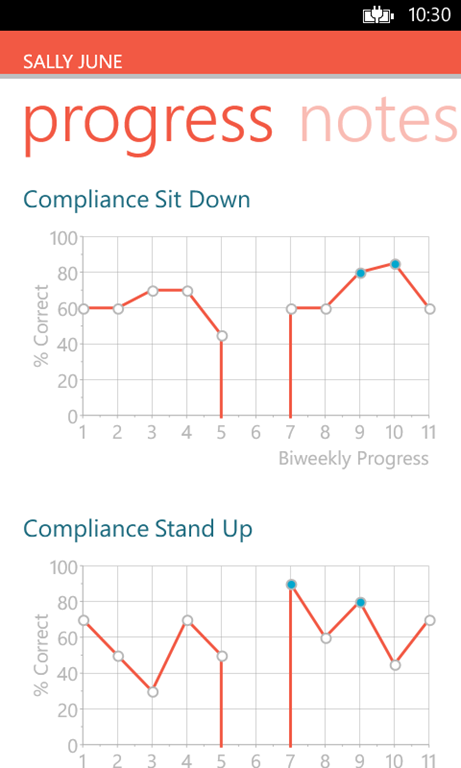 The app has the ability to track behavioral data, record session notes, review client progress, map client addresses, help keep Interventionists in the know about cancelled/postponed/rescheduled sessions, and more! What is currently an extremely inefficient system could be streamlined to benefit the client as well as the service provider. My goal when I set out to create LionHeart was to show that technology can be used in simple ways to accomplish great things! 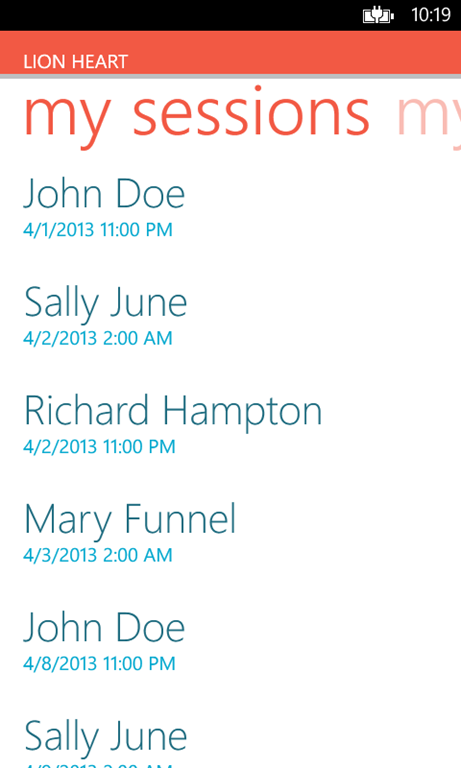 My wife wishes she could use LionHeart in the work place, but that of course requires much more than a simple Demo app. I hope, in the near future, that Autism service providers will strive to adopt time saving and quality of care improving technology such as LionHeart. InterKnowlogy is a wealth of knowledge and I continue to be impressed by how well our team works to effectively deliver awesome and amazing software. I would love to see InterKnowlogy partner with Autism service providers to make LionHeart a reality! The name itself is a fun little story. I had been contemplating a name for a few days for the project. The thought came to me that these kids have huge hearts. They are just so full of love. And while this thought ran through my head I was staring at a pad of paper my mother in-law had given me with a print of a lion on it. I realized lions have big hearts and these kids are often as wild as a lion. How fitting then to give the app the title of LionHeart representing both the challenges and rewards for working with children with Autism. I would have never finished LionHeart with out the awesome support of the InterKnowlogy team and our RECESS time. You can learn about RECESS here. 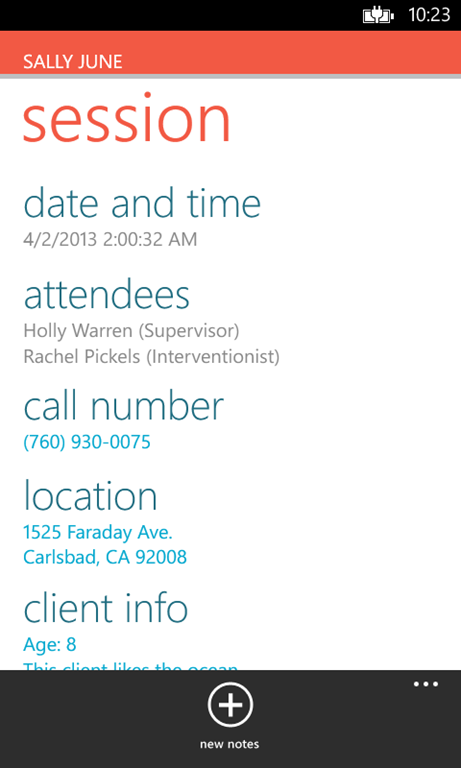 A special shout out to Beth Juncal who help me work with a designer to make the app beautiful. A huge thanks to Xen Rabara who came to InterKnowlogy in January as a fresh graduate from my alma mater Neumont University, and styled almost the entire app! Travis Schilling also helped me get in a crucial last minute revision to help with usability! Of course I want to thank the company Holly works for, C.A.S.E. Inc., and especially her boss, Cynthia Norall, who has helped me understand the challenges faced by Interventionists in the field. And finally my wife Holly who continues to impress me everyday in her care and love for children with Autism! 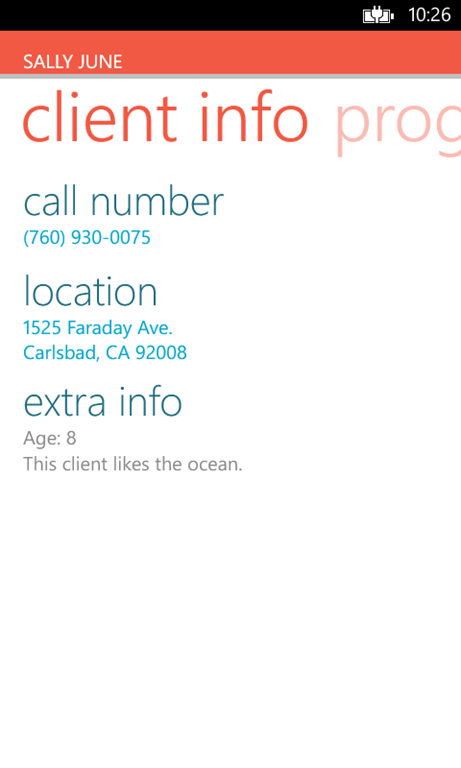 If you’re a developer interested in learning how to make a Windows Phone app like LionHeart check out this blog series on how LionHeart was created.